If your browser’s homepage has been changed to Search.youronlinegameplay.com, then your computer has been infected with a browser hijacker. If you are looking for ways to remove this infection, then look no further. We have analyzed this hijacker and we want to share our findings with the rest of the Internet community. We have also included a removal guide following this short description that we hope will prove useful for those of you who are not tech-savvy. Search.youronlinegameplay.com is more than just a search engine. Its accompanying browser extension is set to modify your browser’s settings, and thus, change your browser’s homepage, new tab page, and search provider. If you disapprove of this hijacker’s actions and want to get your old browser settings back, then please read this full article. Without further ado let us get to this program’s origins. Our research has revealed that Search.youronlinegameplay.com comes bundled with a browser extension called Your Online Gameplay. This extension is known to be distributed on a website called Youronlinegameplay.com/youronlinegameplay. We have found that Search.youronlinegameplay.com is a product of a company located in Portland, Oregon, USA. But this company’s name still remains unclear. On the other hand, we know that the extension — Your Online Gameplay — was released by a software developer SaferBrowser. None of these developers are legitimate which only goes to show how unreliable this browser hijacker is. Now, let us get to the technical issues regarding Search.youronlinegameplay.com. 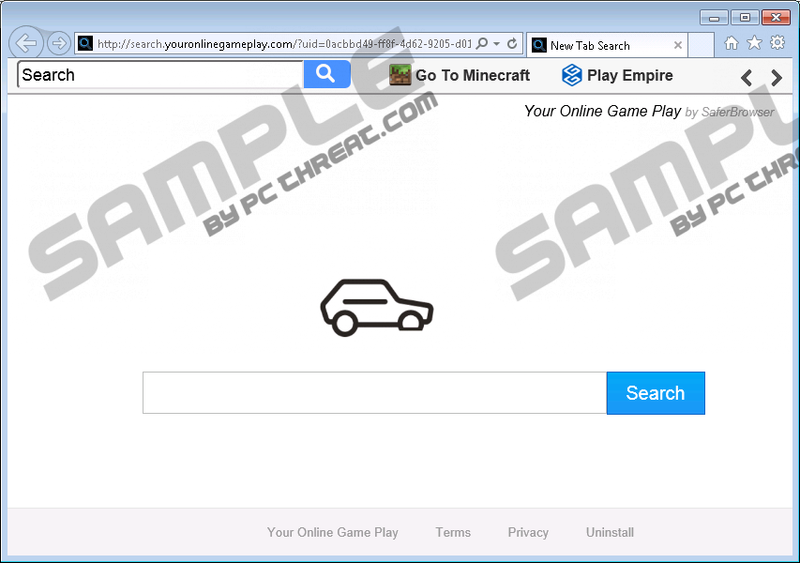 So, once installed, Search.youronlinegameplay.com will automatically change the homepage for Google Chrome, Microsoft Internet Explorer, and Mozilla Firefox. It will also change the new tab page for Firefox and Internet Explorer. This hijacker might also modify your browser’s search provider and change it to Yahoo.com, but our tests did not confirm that this is always the case. All of these actions are performed without your consent. However, Search.youronlinegameplay.com is considered a browser hijacker, because it prevents you from modifying the browser settings. So any changed you make will be overridden by this hijacker. There is no reason to keep to Search.youronlinegameplay.com, because all of its searches are redirected to Yahoo.com. The difference is that to Search.youronlinegameplay.com’s owners cannot be trusted as they are apt to include shady promotional links into this search engine’s search results. Furthermore, it is obvious that this hijacker will collect certain non-personal information about you, such as your approximate geographical location, browser settings, PC specifications, list of installed programs, browsing and search history, and so on. Basically, any obtainable information will be used for advertising purposes in order to make the ads more appealing and implement targeted advertising. The provided information clearly indicated that to Search.youronlinegameplay.com is an infection that you ought to get rid of as soon as possible. It will prevent you from getting your old browser settings back unless you remove it from your browser’s list of extensions. Note that if you are using Internet Explorer, the removal process is a bit trickier, but nonetheless, Search.youronlinegameplay.com can be gotten rid of will relative ease. Find Your Online Gameplay among other extensions and Remove it. Find Your Online Gameplay and Remove it. Quick & tested solution for Search.youronlinegameplay.com removal.